Named in honour of Clifford von Kuster, the first dean of the Faculty of Music, the recital hall is located in the Music Building with the entrance off the main lobby. Under the direction of the concert manger, the 248-seat von Kuster Hall is home to more than 270 performances each year between September and May. The hall is primarily used as a venue for the performance of chamber music and small ensembles. Check out our Events Calendar for upcoming performances. The recital hall is the performance venue of choice for faculty, guest artists, choral recitals and masterclasses. It is also the primary performance space for undergraduate and graduate credit recitals and home to the signature "Fridays @ 12:30" concert series. In recent years, artists from Canada and the United States have been attracted to the hall as a recording venue. Although recording opportunities are limited due to the heavy performance schedule in the hall, we are seeing growth in this area, particularly in the summer months. Any inquiries regarding the use of von Kuster Hall should be directed to Louis D'Alton. View the 360 degree video. 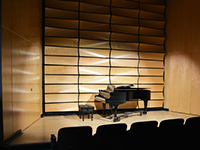 Opened in fall 2015 as part of the new Music Building, Studio 242 is located on the second floor of the Music Building. This intimate 48-seat recital hall provides the ideal venue for solo and chamber music recitals, undergraduate credit recitals, masterclasses and other special events. With fixed-seating, full recording capabilities and professional stage lighting, this additional performance space is in regular use throughout the academic year. Any inquiries regarding the use of Studio 242 should be directed to Louis D'Alton.